In the words of a twenty-first-century Lloyd’s underwriter, ‘insurance is the mortar between the bricks of commerce’. It provides contingent capital which is transformed into cash in times of crisis, allowing entrepreneurs and companies to trade with smaller quantities of conventional capital than are prudently necessary in their particular, perilous trading environments. In so doing, insurance transforms many of the uncertainties of capitalism into fixed costs.1 Further, it does so remarkably efficiently, a fact confirmed by its surprising resilience, and by the steadiness of its structure. 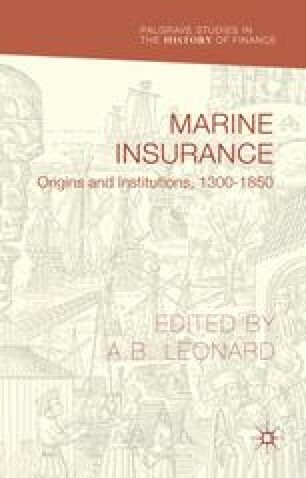 As this volume shows, the basic instrument of premium-based marine insurance remained almost identical over the entire four-century period covered by the contributors, beginning about four hundred years before Lloyd’s emerged as a distinct, branded insurance market in 1769.2 Today underwriters there, elsewhere in London, and in the other marine insurance centres of the world trade in a financial product which continues basically unchanged from that which was used centuries before, right down to the wording of the contract, called a policy.